Trevor Griffith received his first training in Barbados as a chess arbiter from Lindsey Bellhouse, who is one of the four international chess arbiters of Barbados. Bellhouse, who moved to Great Britain a few years ago, has remained his mentor in this field ever since. Trevor's interest in chess started at school, where he represented the school for the first time in 1983. His main activity in chess has been as an assistant-arbiter for the past seven years, mainly youth tournaments. His most recent assignment was at the Sagicor Open Youth Tournament in July of this year. At the international level, he was assistant-arbiter at the Pan-American Youth Festival in Porto Alegre, Brazil in 2000 and the Ladies Zonal Final in Barbados in 2001, the Continental Championship of the Americas in 2003, the largest tournament of the region. About all the top grandmasters of the region were there. 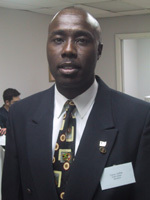 In 2003 and 2004 he was an assistant-arbiter in the national chess finals in Barbados. This is the first time he is chief arbiter at an international tournament. He has dedicated much time to school chess and has been a vice-president of the Barbados Chess Federation, with responsibility for youth affairs, for six years. Organizing school chess is a lot of work, but is very rewarding. Over the years the young players have shown a considerable progress in their games; now there are various young FIDE rated players and in international tournaments they consistently perform better. The youth are the most active players in chess in Barbados, and they are more involved in international competition. Therefore they are more exposed to high rated international chess than the senior players. There is, e.g. an annual summer competition between Barbados and neighbouring country Trinidad & Tobago. This could be, at times, twice a year in Barbados and Trinidad & Tobago, respectively. The junior players provide for their own travel expenses by seeking sponsors, while the Barbados Chess Federation also provides some funding. This is Trevor's first visit to Curaçao and he is very happy to be here. He is impressed by the friendliness of the people, and they make him feel at home. What has struck him is that the country is so much drier than Barbados; he had expected the same tropical lush vegetation here. Another striking point is the cleanliness of the streets. It is, further, really phenomenal how many languages the people speak. Trevor is desperately struggling to learn Spanish, as chess in this region is predominantly played in the Spanish-speaking countries. Barbados and Trinidad & Tobago are the leading English-speaking countries in chess in the Caribbean. When asked for his opinion on the average rating of chess in Curaçao, he took the junior players of Curaçao as reference, as he is most acquainted with them. Taking in account that the young Curaçao players have won the club and national championships of Curaçao in the last years, he is inclined to rate the Barbados chess as stronger. (Note by the interviewer: Marvin Dekker, who is in a playoff for the club championship of Curaçao, ended on the second place in the Sagicor Open Youth Tournament last month). Trevor is very content that he has been invited to be an arbiter at this tournament. He finds that it has a good level with several international grandmasters and woman grandmasters. He finds that Trinidad & Tobago and Jamaica have missed a good opportunity to play against grandmasters. He will certainly promote this tournament when he gets back to Barbados. He, of course, acknowledges that travelling expenses and itineraries may pose some serious barriers for the players. However, Jamaica and Trinidad & Tobago have direct flights to Curaçao, so that for these countries there should be no problems with the flight connections.